But Neely sees something else in West Louisville. Some­thing he considers much more important and true to his experience. Neely is one of several West Louisville youth fellows working with the University of Louisville’s School of Public Health and Information Sci­ences (SPHIS) to rewrite the narrative of how West Louisville neighbor­hoods, residents and, specifically, youth are viewed. 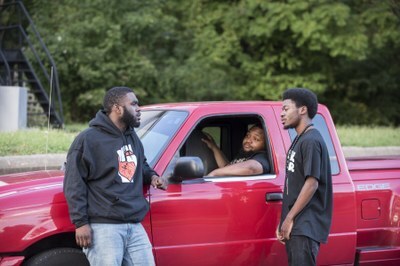 By combining aca­demic research with grassroots community action, UofL’s Youth Violence Prevention Research Center (YVPRC), aims to reduce youth violence by helping young people understand the context associated with the condi­tions in which they live, and to provide them with the tools they need to lead the community toward transformation. The YVPRC was established in 2015 with a five-year, $5.7 million grant from the Centers for Disease Control and Prevention (CDC), and is a National Center of Excellence in Youth Vio­lence Prevention. It is one of only seven Centers of Excellence in the country dedicated to curbing youth violence. Changing social conditions requires a thorough understand­ing of how those conditions came to be. That’s why another goal of the YVPRC’s efforts is to counter and shift the dominant narra­tive surrounding what it means to be an African American in the United States, a narrative borne from injustice and inaccurate portrayals of history. The YVPRC faculty and staff brought years of behavioral research to the table. But to truly affect change in West Louisville, they couldn’t rely on research alone. They needed the expertise of the community. In this case, many of the experts were teenagers. The center chose a cohort of eight young people between the ages of 16 and 24 from West Louisville to be Youth Violence Pre­vention Fellows. The fellows, along with YVPRC and community partners, are designing and implementing a three-year social-norming campaign targeted at get­ting their peers to change long-held behav­iors, and boost pride in their community and their culture. “Science tells us that social norms affect individual behavior,” Wendel said. “If we think people who are like us act a certain way or expect us to act a certain way in a specific situation, we’re more likely to act that way — whether we agree with it or not. The social-norming campaign, called “Pride, Peace, Prevention,” launched in spring 2017 and uses social media, televi­sion and radio ads, bus shelter signs and billboards to connect youth with positive messages and imagery relative to African Americans. The fellows also use local com­munity events, like block parties and the Dirt Bowl, an annual West Louisville bas­ketball tournament, as opportunities to engage the community in conversation. Before the fellows could share the cam­paign message with their peers they needed to build pride in themselves by gaining a more accurate understanding of their race and culture. They participated in ses­sions to raise their critical consciousness, including those that connected historical facts with current context and taught them how to dispel myths surrounding what it means to be an African American youth. The fellows spent hours researching African and world history, learning about an African heritage that reveals a lineage of royal families, kingdoms and empires, and developments and contributions to the fields of medicine, science and technology. They immersed themselves in stories that history books often gloss over, including how Afri­can Americans contributed to building the infrastructure and economic capital of the United States through slave labor. They grew their understanding of mod­ern-day African American hidden fig­ures, coupled with a once-in-a-lifetime experience to take part in the dedication ceremony of the Smithsonian National Museum for African American History and Culture, and be among the first to encounter hands-on exhibits about the fight against racial injustice throughout American history. It was important for the fellows to under­stand the history of policies and practices, such as racial segregation and redlining, that resulted in West Louisville looking the way it does and its residents experiencing the struggles they experience, Ingram said. “A person doesn’t wake up and say ‘I want to kill someone and go to jail’,” said 17-year-old Jailen Leavell, one of the fellows. The imagery for the Pride, Peace, Preven­tion campaign shows the fellows recreating African American leaders who changed history, including Rosa Parks, Thurgood Marshall, Tom­mie Smith and others. Thomas, for example, portrays Smith in one ad, while Leavell replicates one of Muhammad Ali’s famous poses in another. Imitating these heroes inspired the fellows. “It helped me gain a sense of self-knowledge,” Thomas said. Personal growth is critical to the YVPRC mission. “In addi­tion to cultivating a positive racial identity, growing youth in the areas of leadership, advocacy and activism is another important role of the YVPRC,” Ingram said. “We hope to give them a space to develop what they already have within themselves and build capacity to bring lasting change to communities. After learning the history of his neighborhood and his culture, Thomas began to examine his own past. He admitted to using violence as retaliation after bul­lies taunted him; it even got him expelled from his high school. “I ended up responding the only way I knew how, which was vio­lence,” he said. Thomas, who later earned his GED and has attended classes at Jefferson Community and Tech­nical College, said his time with the YVPRC has helped him think more critically about how he responds to provocation, and how he can affect change in himself and his community. One of the action strategies is to have the fellows work with YVPRC partners, including the Louisville Metro Office of Safe and Healthy Neighborhoods and Jef­ferson County Public Schools, to creatively express their own ideas for furthering the potential impact and application of the Pride, Peace, Prevention campaign. For example, Leavell began a Black Student Union at his high school, with the goal of educat­ing his peers about African Amer­ican history, racial issues and social justice. Meetings included discussions with African Amer­ican community leaders such as Attica Scott, a Kentucky Con­gresswoman and former Louis­ville Metro Council Representa­tive, and Kevin Cosby, president of Simmons College and senior pas­tor of St. Stephen Church. Leavell, who completed his YVPRC fellowship this summer, is now a broadcast major at Tennes­see State University. He hopes to launch a campus television show there that tackles racial and social justice issues. Before his expe­rience with YVPRC he did not understand how historic practices and certain legislation could contribute to poverty and violence, he said. Now, he feels it is his responsibility to inform others. The YVPRC plans to hire a second cohort of youth fellows to work with research­ers such as Aishia Brown, a postdoctoral associate at SPHIS with expertise in social justice youth development. Brown has assisted YVPRC leadership in devel­oping curriculum and future training opportunities that focus on youth lead­ership and youth community organizing. In two years, a third cohort will assess the effectiveness of the campaign, com­paring the results to the community of East Nashville, Tennessee, which serves as the control site for the project under the leadership of Maury Nation, asso­ciate professor at Vanderbilt Univer­sity Peabody College of Education and Human Development. 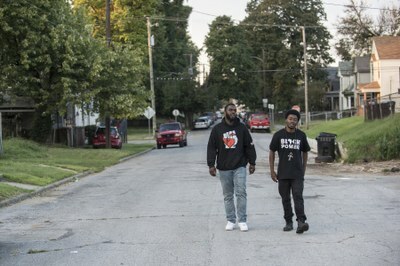 Ideally, the cam­paign will have contributed to lowering incidents of youth violence in Louisville. Working with the YVPRC provides a sense of hope that change is possible, Neely and Thomas said. “If you can just touch one person, it sets off a domino effect in the community,” said Thomas. Still, they temper their optimism with reality. “Survival sets precedence, so it’s hard to receive that message [of potential change] when you’re focused on other things, like having food to eat,” Thomas said. Neely acknowledges that the YVPRC faces an uphill battle in adjusting perceptions. Neely, who now works for the Office of Safe and Healthy Neighborhoods and plans to resume classes at UofL, will continue as a YVPRC youth fellow for another year so he can keep shifting West Louisville’s story and sharing with other young people what he has learned. This article first appeared in the fall 2017 edition of UofL Magazine.